It seems everyone is tired these days. We live in a time where we have more expectations and more to do than any previous generation. Most of the things that were designed to make our lives more efficient and our quality of life superior to that of the past are causing us to deteriorate mentally, physically, and socially. So much for the modern era of being able to do and have it all. Take the next 30 days to really look at burnout with your readers: what causes it, how to prevent it, and how to rejuvenate if we have pushed ourselves past prevention. Each day you will receive a new opportunity to better understand what burnout is, as well as the effects it has on our minds, bodies and the entire family. Our 30 Days of Dealing With Burnout and Fatigue is designed for you to grow your list and inspire activity in your community. In the content you share helpful tips and advice and to go along with it, emails go out each day that point readers to the new content and challenge them to follow along. With this content bundle, you challenge your readers to overcome burnout and fatigue over the course of a month. Welcome And Why Are We So Exhausted All The Time? Are Mental Health And Burnout Related? Are Your Behavioral Patterns Causing Burnout? Is Caffeine Causing Your Fatigue? This could be a free challenge to help you build your list and grow engagement with your readers, or it could be a paid product for a life or business coach. The content could also easily be turned into a 30-day group coaching program on getting over burnout and fatigue. 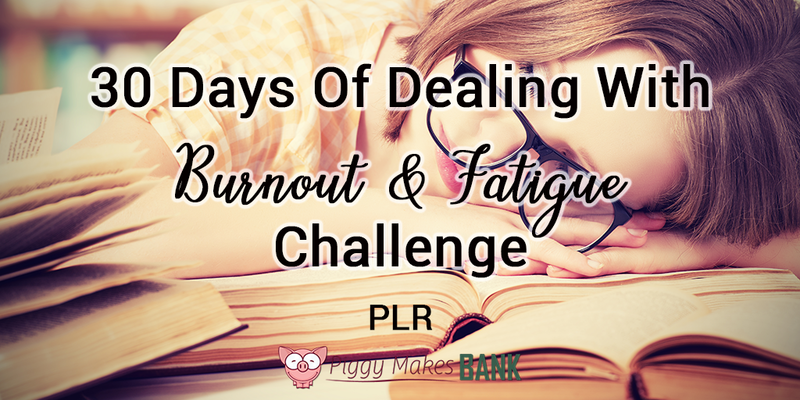 If you know how to copy and paste, you can set up this 30 days of pre-written content all about dealing with burnout and fatigue. Keep it free or make it a paid product. We put together a “how-to” guide to help you implement this PLR and use it to grow your list. Use it for this challenge, but also for any other 30 day email challenges you may want to run down the road. We've even included a section on how to write the content for your challenge yourself. We share everything we do to run and promote these 30 day challenges and grow our lists fast. Frankly, this bonus alone is well worth the price of the entire PLR bundle. Get this 30 Days of Pre-Written Content About Dealing with Burnout and Fatigue. Perfect for Creating a Community Challenge PLUS BONUSES for just $47 – and Start Growing Your List Today!